No date has been set for the resumption of the Commission of inquiry into what transpired at the Ottley Hall ShipYard and Marina, as well as matters into Frigate Rock in Union Island. However, the flow in the issue has been stalled over recent months with two challenges in the High court. In the latest developments surrounding the inquiry, the High Court struck out the claim brought by former national Commercial bank chairman Richard Joachim and former Communications and Works Minister Glenford Stewart. 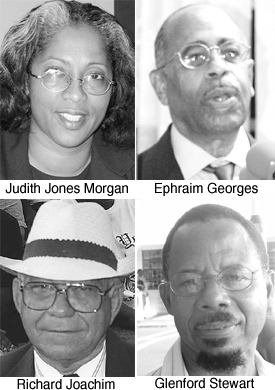 The Suit 263 of 2004: was against Attorney General Judith Jones-Morgan and sole Commissioner Justice Ephraim Georges. The ruling, made July 2, 2004 in the High Court, struck out the claim, âas disclosing no grounds to bring the Claim and as being an abuse of process.â Joachim and Stewart had alleged that the instrument appointing the Commissioner was invalid, null and void and that there was a real likelihood of bias in the Commissioner. However, following legal arguments on July 1, Master Brian Cottle agreed that the allegation of bias had no prospects of success and that Georges was validly appointed by His Excellency the Governor General and struck out the Claim form and the Statement of Claim in their entirety. Lawyers Nicole Sylvester and Rochelle Forde represented Joachim and Stewart. Lawyer Andrew Cummings appeared on behalf of Attorney General Judith Jones Morgan, while Commissioner Georges was represented by Alair Shephard QC and Joseph Delves. The Ottley Hall matter has been a bone of contention since it surfaced here in 1992. Some 200 million dollars were spent on a facility at Ottley Hall, located on a beach just one mile west of capital city Kingstown. An accounting company put the value of Ottley Hall at EC$20 million. The inquiry has generated widespread interest. There has been a chord of disbelief as to the extent of matters at that Marina. Money from the National Commercial Bank was loaned to Union Island Marina for works undertaken by the same company responsible for Ottley Hall. Persons following the Ottley Hall inquiry are keen to know when the investigations are likely to continue, but as far as secretary of the Commission Roslyn Harry indicated âno date has been set for the continuation.